Snow, mixing with rain southeast. Highs in the 30s. Overnight Wednesday: Clearing, icy roads north. Lows in the teens. 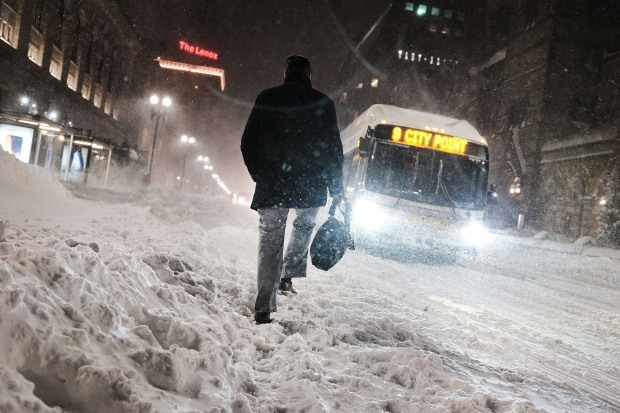 A Winter Storm Warning is in effect for much of central New England. There is also a Winter Weather Advisory in effect surrounding the warning. The warning means six inches of snow on the way, the advisory means a few inches of snow. The only place with no warnings is Cape Cod and the Canadian border. On Cape Cod, it's going to be too warm for snow, at the Canadian border too dry. The front of that brought snow all the way down to South Texas and Louisiana, with a band of snow extending all the way into New England — pressing to the east tonight. New low pressure is developing off the coast of Virginia and there is an energy transfer happening now from the front in Northern New England to the coastal low south of Cape Cod. A minor gap between these two systems is falling in over Massachusetts right now. Trying to time at all, it looks like a 12-hour storm from about midnight to noon far west, from about 7 a.m. to 7 p.m. in the state of Maine. In Boston, it's 3 a.m. to 3 p.m., but the heart of the system is right during this morning's commute, heavy snow from 7 to 9 a.m.
Bands of snow may reach 1 inch or greater per hour for a couple of hours. 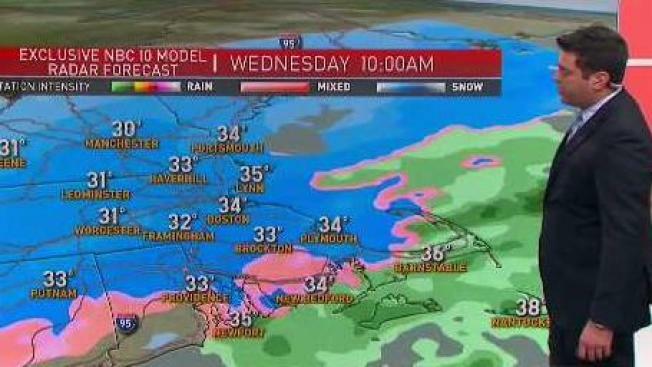 Snow is going to change to rain quickly along the south coast, that rain-snow line will progress right into Boston by mid-morning. Near the rain-snow line, about 3 or 4 inches are expected near Boston. It's along and just north of that line where the heaviest and wettest snow falls, making it the most difficult to remove. To the north, snow amounts may be a little higher in the order of 5 to 8 inches, but it's a drier and easier snow to deal with. With low pressure being weak and tracking right over southeastern New England, we do not expect a lot of wind with the system. Colder air arrives this evening, so any slush turns back into ice. Weak high pressure will move in with sunshine for most of us tomorrow, with temperatures close to freezing. A weak area of low pressure comes over on Friday, but we expect it to be dry, with a mixture of sun and clouds as temperatures start to moderate, high in the 30s. Though there is a challenge to the weekend forecast we think a front should stay north of New England, perhaps bisecting northern Maine, and we should mostly be on the mild and dry side of this front. Other than a few rain or snow showers in Maine, our weekend looks mostly sunny with a high temperature in the 40s to perhaps 50 degrees. The Patriots game should be dry and probably on the mild side.